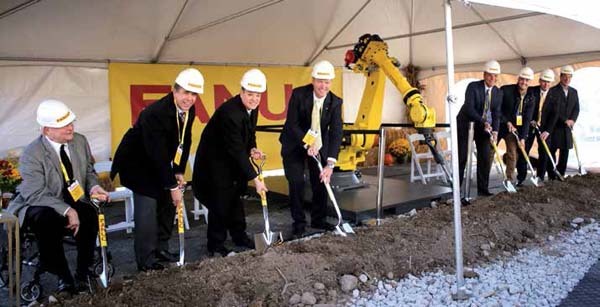 ROCHESTER HILLS, Mich.—FANUC America Corp., a major supplier of robotics, CNC systems, and industrial IoT products, broke ground in October 2018 on its new North Campus facility in Auburn Hills, Michigan. With the addition of the new North Campus building, FANUC America’s three facilities in Michigan total 1,155,525 square feet, the company said. Scheduled to open in the fall of 2019, FANUC America’s new North Campus will house engineering, product development, manufacturing, and warehousing. The $51 million expansion is expected to create 100 jobs. FANUC’s products are applied in a wide range of industries, including automotive, aerospace, consumer goods, food, pharmaceuticals, logistics, and warehousing, to name a few. Since 1982, the company’s line of painting robots, and a variety of automation software products, have been designed and built in Michigan. “To highlight the importance of robotics in the manufacturing sector, we’ve included one of our robots to help us break ground,” Cicco said. Employees, customers, and guests cheered as the robot broke ground along with FANUC executives and several local and state dignitaries. Among those attending were Congressman Mike Bishop; Oakland County Executive L. Brooks Patterson; Auburn Hills Mayor Kevin McDaniel; and MEDC Rep. Ricardo Gonzales.